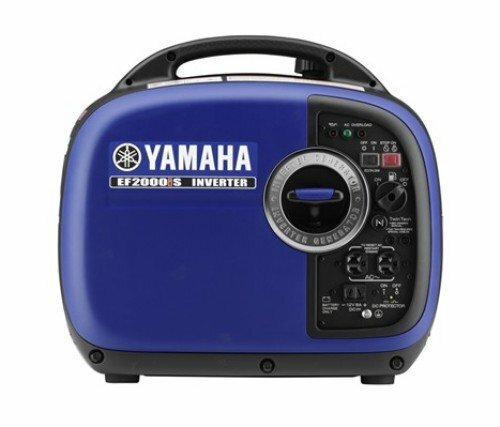 Which portable generator should I buy? Is one of the most frequently asked questions on Pure Living for Life. To answer this, we’ve reached out to the large community of portable generator users to learn which generators they use and why, and to find out about their portable generator experience. In 2016 there are more options than ever when it comes to buying a portable generator. Portable generators are not created equally: there are different models for different needs. Whether you need a portable generator that’s quiet, small, electric an inverter, runs on diesel or runs on propane, this portable generator buyer’s guide is sure to help you find the best generator for your needs. In this buyer’s guide, we’ve made it easy to find the best portable generator for your needs in the 5 most popular portable generator categories. These categories include quiet, small, diesel, propane and inverter portable generators. One complaint among generator users is that they are loud! Many generators certainly are, but there are also many generators that are on the quieter side with a lower decibel rating. Just to give you an idea of how loud a particular generator is (measured in decibels), check out this decibel chart to see what various decibel rating sound like. Here are the top-rated, most-popular quiet portable generators according to hundreds of user reviews. * Not all of these appliances can be used at once. Click here to discover your power wattage needs. The Honda EU3000i Handi generator is the #1 best generator if you are in need of something with high wattage, capable of running multiple power-intensive tools or appliances at once, that is serviceable in most cities, that is both lightweight and easy to transport, and that is also extremely quiet. This generator is not the cheapest on the market, in fact, it is one of the more expensive generators in the 3000w category. That said, it can be worth it because it integrates seamlessly into a quiet lifestyle. We are able to hold a normal conversation next to the generator without it being intrusive, can run it while we’re sleeping inside, and we barely notice when it’s on. We use this as our primary power source so it’s important that it isn’t loud… we also don’t want to anger the neighbors! This can be great if your power needs are higher, if you’re in an RV park, if you have close neighbors, and if you need to move the generator at all. Whether you are strong or a more fragile person, the wheel kit on this generator really helps because no strain is required on your body to move the generator where it needs to go. 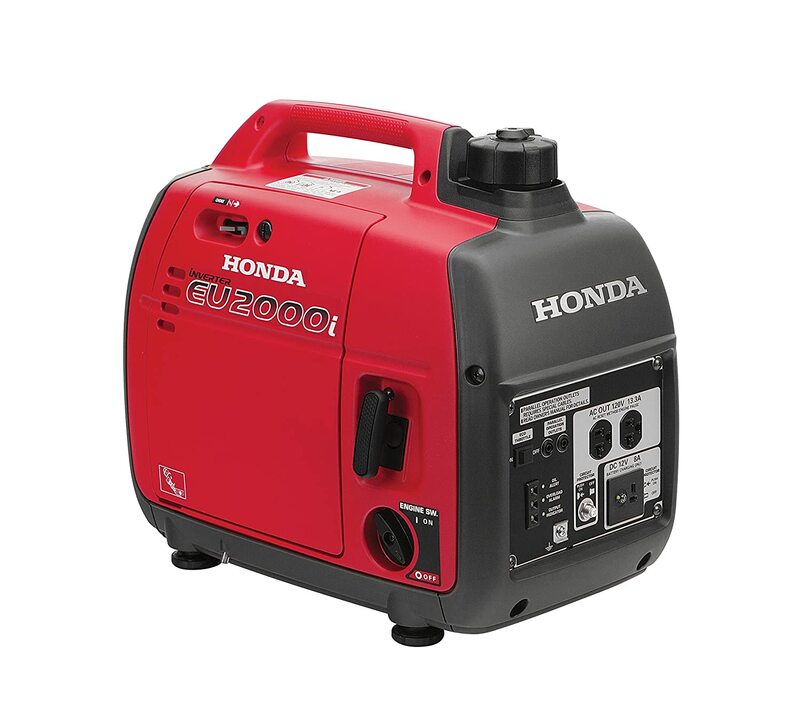 The Honda EU2000i is another great, quiet portable generator. This is much more ideal for someone that needs a generator for light use and won’t be running multiple appliances or power tools at once. It doesn’t take much to max out this generator, but that is okay if you wont be using more than 1600 watts at once. The Honda EU2000i is much more lightweight than its EU3000i Handi counterpart, weighing in at just 45.6lbs. Because this one is easy for most to lift without assistance, it doesn’t have a built-in wheel kit. The Yamaha EF2000iS is comparable to the Honda EU2000i. They are similar in weight, watts, fuel capacity and even run time. The only downside to the Yamaha compared to the comparable Honda model is that Honda dealerships far outweighs Yamaha dealerships. If you’re on the road a lot and experience problems with your generator, your chances of finding a Honda dealership to service your generator is higher than finding a Yamaha dealership. If you will be stationary while using your generator, be sure to look at service options in your city or neighboring cities. Having an unusable generator for any prolonged period of time can be a huge problem! While traditional generators run on gasoline fuel, some would rather have a generator that runs on propane. The reasons for this are plentiful. First, while gasoline can degrade over time requiring the use of stabalizers to make the fuel usable, propane does not. If you plan on storing your fuel for a long time (like if you only plan on using yoru generator in emergencies) then propane may be the way to go because you can store propane tanks indefinitely. Second, gasoline may be hard to access in an emergency. IF the power is out, you won’t be able to go to the pump and get fuel. If you have a bunch of filled propane tanks, you will be set and will be able to use your generator as a power backup. Third, propane isn’t messy to deal with like gasoline can be. You won’t need to worry about spilling the propane and making a mess. To use the propane, all you need to do is mount it to the portable generator (typically a 20 or 30lb tank) and you’re good to go. No mess, no hassle! Here are our favorite, top-rated, most-popular portable propane generators. 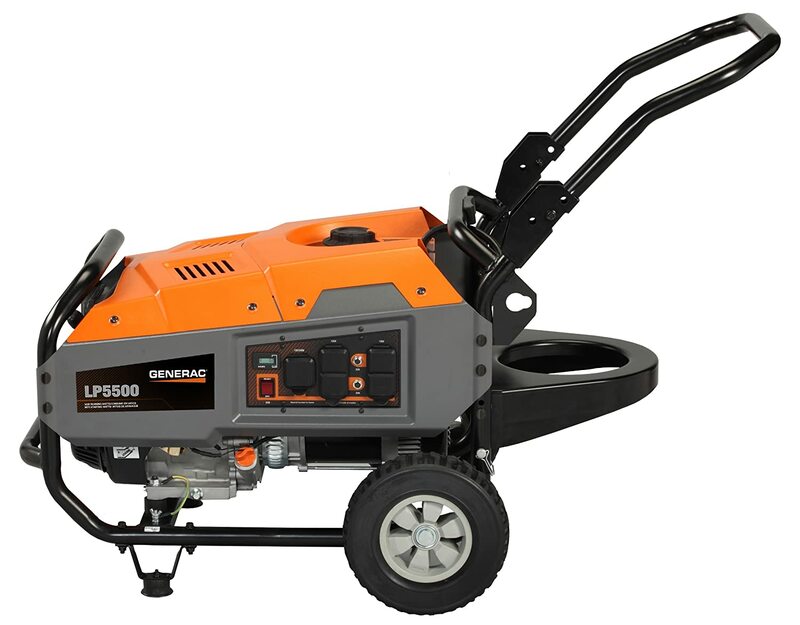 The Generac LP5500 has a place to store both a 20 and 30lb propane tank. It has a folding / nesting handle for compact storage. The wheels allow for easy transportation and best of all – they can never go flat and are great in all terrains! The Generac LP5500 is a great go-to generator for folks that want a reliable power backup from their home, don’t want to deal with gasoline fuels during refueling, may not use the generator frequently therefor having propane sitting around would be better than gasoline as propane doesn’t degrade over time, and wants a straight-froward generator that can be used with ease during an emergency. The Generac LP3250 is very similar to the Generac LP5500. Both have the advantages of propane (longer life, doesn’t degrade over time, non-messy, etc.) 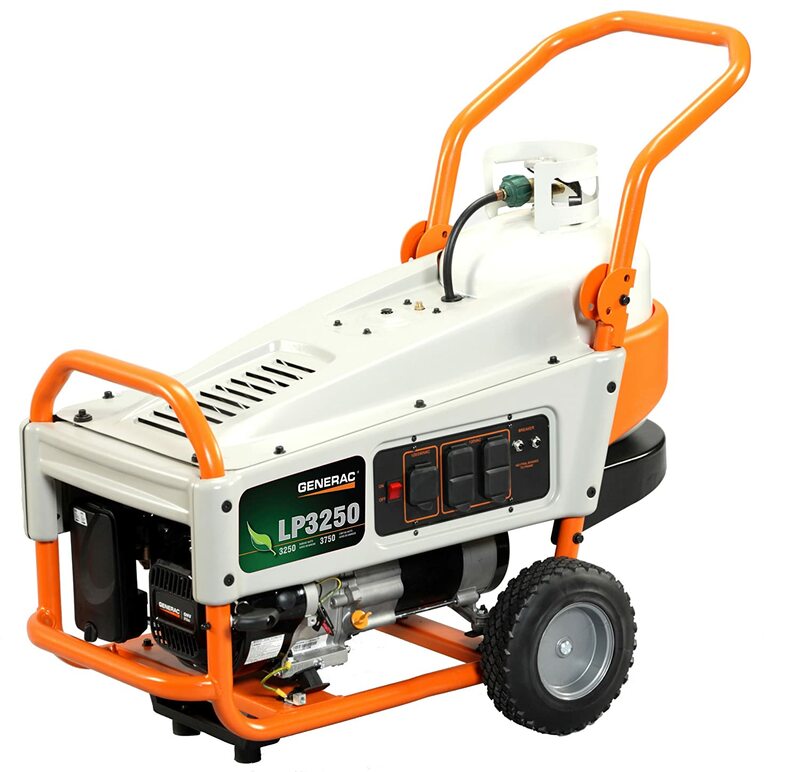 except the LP3250 is a slightly smaller portable generator, can only us a 20lb propane tank, is a little bit lighter, and has less wattage output. This would be ideal for the home that won’t be using many appliances or tools at once as it is only capable of outputting 3250W running (3750 starting wattage). While portable diesel generators are most costly than traditional (gasoline) or propane generators, they do have some advantages which makes them a great solution for some. Generators that run on diesel can output the same amount of power on half of the gas, making them a great investment in the long-run even if they cost more to set up. The are a popular choice for commercial power backups or even the sole power source. Diesel generators can also be longer-lasting than traditional generators if they are maintained properly. A disadvantage to diesel generators is that they are often heavier, which is why there aren’t many portable options! Here is our list of recommended, highest-rated portable diesel generators. Diesel-powered generators are much higher priced than gasoline-powered generators, however they are definitely the smart choice in many circumstances. Compared to gasoline generators, diesel generators require less maintenance, are more efficient and have a longer life. This Generac diesel generator can hold up to 12 gallons of diesel and can run for over 32 hours at half load. It has an integrated lifting eye which makes it easy to transport and secure at a number of different job sites. Some like that it even has an hour meter to track usage and monitor maintenance cycles. 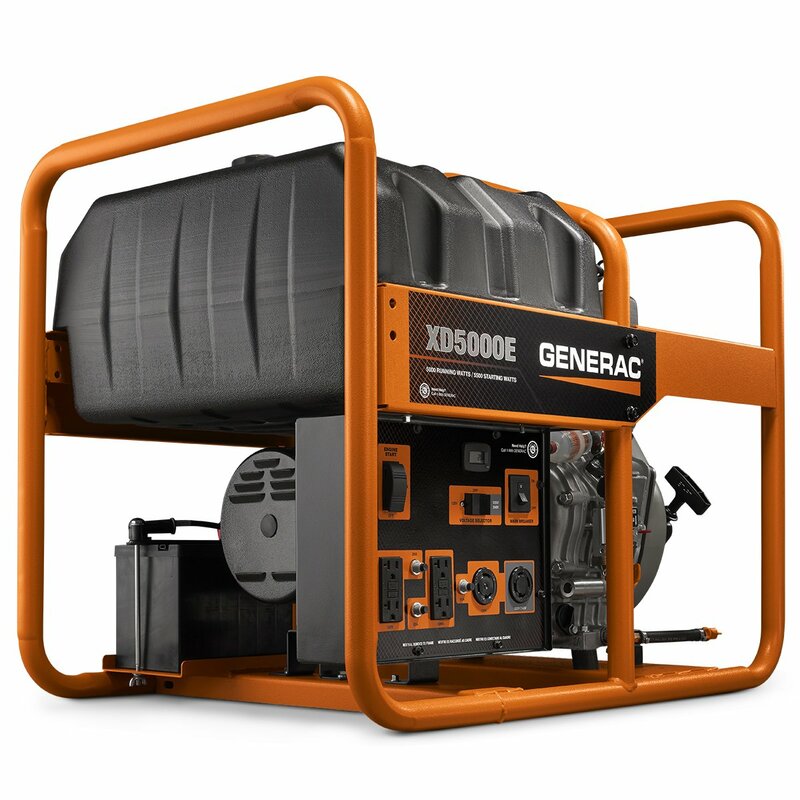 Because the Generac XD5000E generator is 112 pounds, which is heavier than most people care to lift, it does have a portability kit that can be purchased separately which can help with the transporting of the generator to and from job sites. The portability kit includes a handle, wheels and even a front foot. You may ask the question “Are all generators inverter generators?” and the answer is no. Traditional generators produce AC power, at which the motor must run at a consistent speed (usually 3600 rpm) to produce the standard current that most households require (usually 120V AC). If the engine fluctuates, so will the electrical output, so the power isn’t very “clean”. Inverter generators are also known as “3-phase generators” that convert the AC power to DC power, and then back to AC power that maintains a single phase, pure sine wave at the required voltage and frequency. So the power output is much more “clean”. The benefits of an inverter generator include: higher quality power output, lighter and smaller size, quieter operation, parallel capacity and higher fuel efficiency. Ideal For: RV air conditioner (up to 13500 BTU), refrigerator or freezer (Energy Star), microwave oven, incandescent lights, portable fan, TV / DVD, hair dryer, coffee maker, computer, garage door opener, blender, large power tools, running multiple appliances at once & sensitive electronics such as computers, chargers, cell phones, cameras, LED lights and more. If you need a reliable, portable generater backup for your home that is capable of running multiple appliances at once and is also capable of providing power to sensitive electronics, then the Honda EU3000i Handi is the generator for you. While non-inverter generators may be a little more affordable, they are really limited in their use. Because their power isn’t “clean”, it really isn’t ideal for powering the sensitive electronics in your home. They are great for work sites or providing “dirty power”, but aren’t a very good all-around generator. 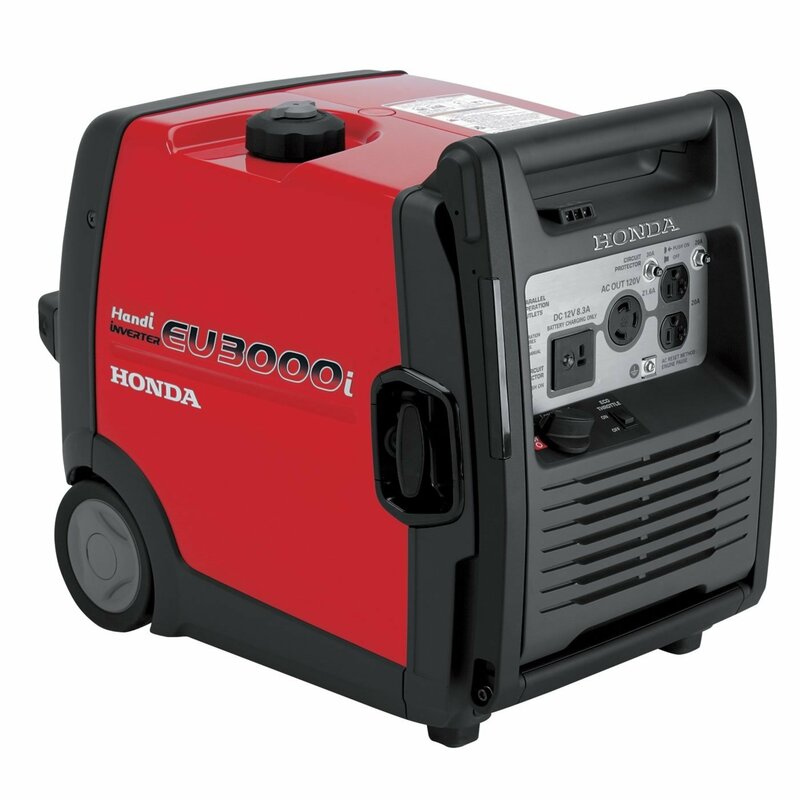 We think the Honda EU3000i Handi is one of the best generators there is, period. With this generator, you can have your cake and eat it too! Not only do you get 3000W of power (which usually goes hand-in-hand with heavy generators), but you also get something that’s lightweight, quiet, portable, reliable, and extremely versatile to power even the most sensitive electronics.